Anyways, my first move was Fives using his special, he called Aalya, who then called Fives... and Echo joined in on that. The Echo Bug may be back, but I only saw it once, so I'll have to do more testing. Anyone else seen the bug's return recently? Remember that Echo can assist any character with attacks, the chance is merely doubled when a clone attacks. Echo was probably assisting Aayla's basic attack which also happened to draw in Fives. That said, I will also watch to see if the Echo bug has returned because that was annoying. Echo assist specifically states basic ability (not attack) during their turn. It was 5's turn and he used special ability. The bug was he was assisting others out side of their turns. Fixed a bug with Echo's Follow-Up ability that allowed allies that weren't currently taking their turn to grant Echo Assists. But echo should still be able to assist. Anytime a regular character gets an assist they attack with their basic ability. Echo assists when others use basic abilities, so he should be able to assist even on anothers assist. 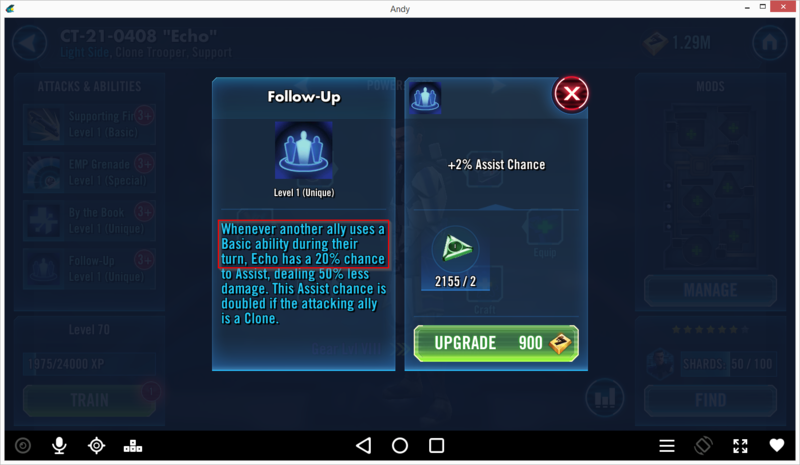 Yes, that's what I thought (see my earlier post...I thought Echo was assisting Aayla, not Fives). Actually, 5s did use his basic ability during his turn, it just was on an assist off of an assist. it was noticed before because in the rancor raid echo was assisting all the clones called with Cody's all call. According to your original post, it WAS Fives' turn. AND he used a basic when called in. HE called Cody in and it was his turn. Worked perfectly. Fives called Aayla called Fives called Cody. Exactly as intended. but isn't every attack after Five's special, an attack out of turn? and therefore should not have called Echo? When Aayla called Fives to assist it was still technically his turn, so him using his basic as the assist is what brought Echo in. The same is true of Cody's 212 attack. Cody uses it, not his basic, but it causes him to attack with his basic, so Echo can essentially attack twice if the 40% trigger goes. Read the orginal post again. To me there is a difference between a basic attack and a basic ability. Basic Abilities, Counter attack and bonus attacks perform a basic attack. of course the powers that be could say otherwise and since 5's was called on Aalya assist if they are the same could be considered use of his basic during his turn. After reading all that, we need video to determine. 5s's use of his basic attack during his turn calls echo to assist. Like I said is all dependent on the wording, which EA/CG has never been consistent with. Do they consider a basic attack and a basic ability to be different or not? No one here can answer that. I only mention it because there are other abilities that specially mention use of a basic attack to get added effects. I never got an Aalya assist chain, but will keep an eye, test with others to see if it is indeed back, or odd coding was my main intention, since id consider using a main ability actually hitting the button, not being called to assist. And if anyone else sees it, we can figure out why, but the timing of the attacks looked like it was from the Aalya assist, though its hard to tell. Did Fives apply Speed Down to opponent? If so, he did use a basic ability during his own turn. I reread the original post. I was correct. I wasn't talking about the original action. I was talking about when he got called in for an assist by Aayla. He applied Speed Down to opponent (which is where he "Used a basic ability during his turn") and THAT's likely how he called in echo. Either way, he is doing what he needed to do on his own turn to make the current coding work. Aayla does that all the time. Haven't geared my Echo yet but I think the code should be the same. He and Fives went into action at the same time, after Aalya.